Bath designers are always excited when new products are introduced to the market. This year, we are amazed by the beauty, durability and functionality of glass, wood patterned porcelain tile, frameless cabinets and engineered stone quartz products. Other hot new products for master baths include eco-friendly toilets and steam showers. 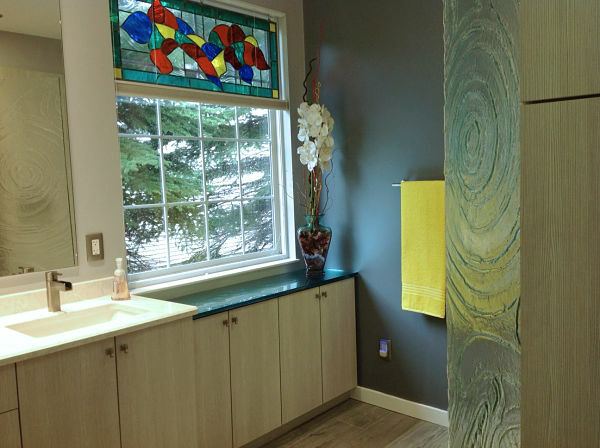 A textured clear architectural art glass shower door, glass counters, a Cambria quartz vanity, frameless cabinets with full overlay doors and textured ceramic floor tile update this master bath. We recently completed several master bath remodeling projects where these new products are used. Glass is a great product for use in bathrooms. It’s hygienic and easy to maintain as well as beautiful. Cast glass is used for counters and each piece is one-of-a-kind. Counter glass is available in two thicknesses, ¾-inch, which can be tempered for strength, and 1-inch. 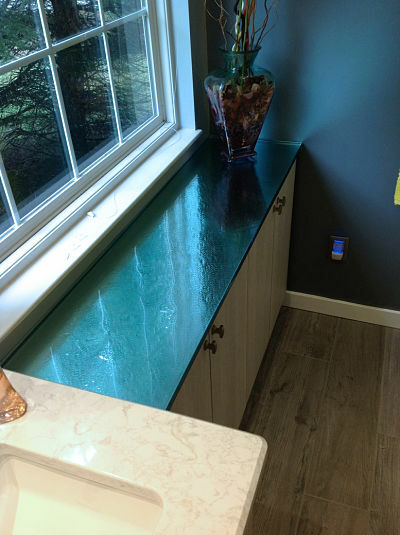 A blue green cast glass counter adds luster to contemporary slab door cabinets. It was placed under a window and reflects light into the room. Architectural art glass can be used for windows, doors, partitions and other applications. The maximum size of a glass panel is 4-by-8 feet. Architectural glass is made in thicknesses ranging from ¼-inch to 1-inch depending on the application it will be used for. 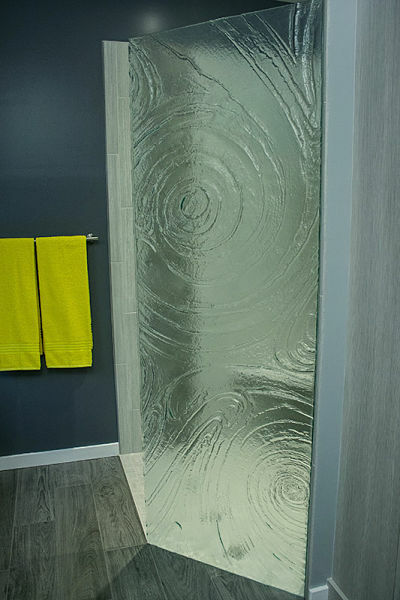 A vortex pattern clear architectural glass panel was used to create this custom walk-in shower partition. High definition porcelain tile is available in patterns that provide the look of plank wood but is not porous. This porcelain tile product is slip resistant, durable, repels water and is easy to clean. High definition porcelain tile used in this master bath resembles tides plank flooring. 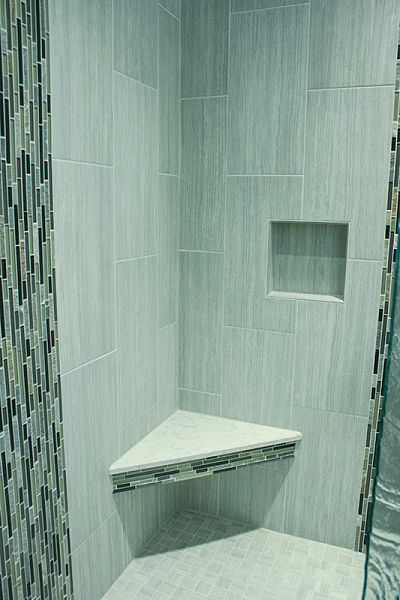 Wood grain patterned porcelain tile was laid vertically in a shower stall as a field and is accented by linear glass mosaic tile also laid vertically. The floor of the shower is 1-inch slip-resistant square tile. The seat is Cambria quartz engineered stone. Dark porcelain tile creates the look of a wood grain floor outside of a walk-in shower with tempered glass wall panels. The sleek uncluttered look of contemporary interior design is gaining popularity in today’s homes. Frameless cabinets expand storage space, especially in bathrooms. Full overlay slab doors have simple lines that provide visual appeal in a room. They are also easy to maintain. 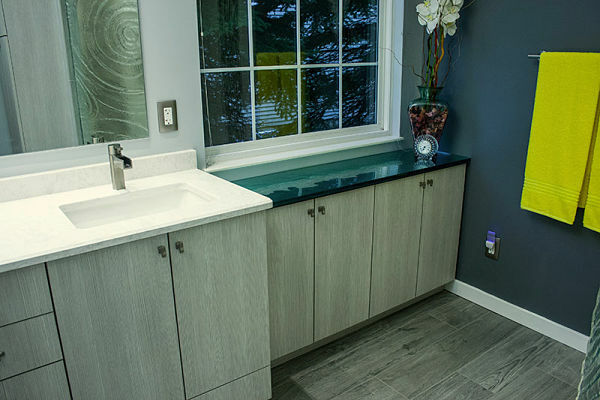 Contemporary frameless cabinets (“Vista” by Brookhaven) expand storage space in this long narrow master bathroom. Narrow 12-inch depth base cabinets with adjustable interior shelves installed under the window provide a space to store smaller items such as soaps, shampoos, cosmetics hand towels, tissue and other bath essentials. 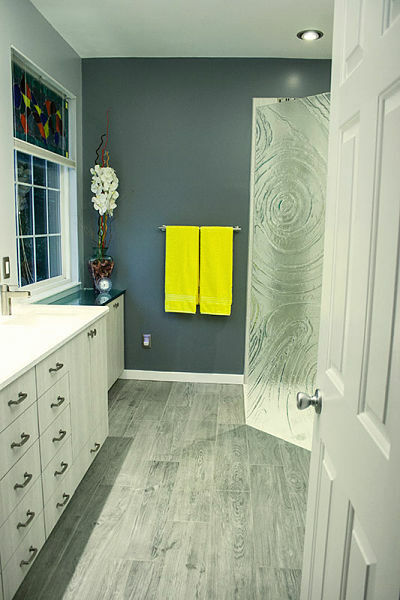 Quartz, and its applications, continues to trend in bathroom remodeling. Manufacturers are improving their products. New designs closely resemble natural granite or marble. The non-porous, hygienic, stain-resistant surface requires no sealing and is easy to maintain. 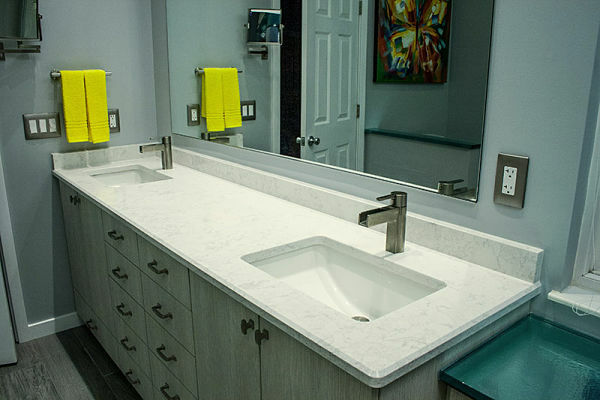 Quartz is great to use in bathrooms because soaps will not leach into the surface and residue can easily be wiped off. Quartz can be used for counters, shower seats and thresholds, as a backsplash, on walls or to cap surfaces. A double vanity with a quartz countertop and backsplash (“Torquay” by Cambria) features Kohler undermount sinks and lever handled faucets. Dual flush toilets are designed for both style and efficiency. There are two modes to help conserve water, a 0.8 gallon per flush mode for liquid waste and a 1.6 gallon per flush mode for solid waste. Eco-friendly toilets are designed to reduce water use by 20 percent or more compared to standard toilets. 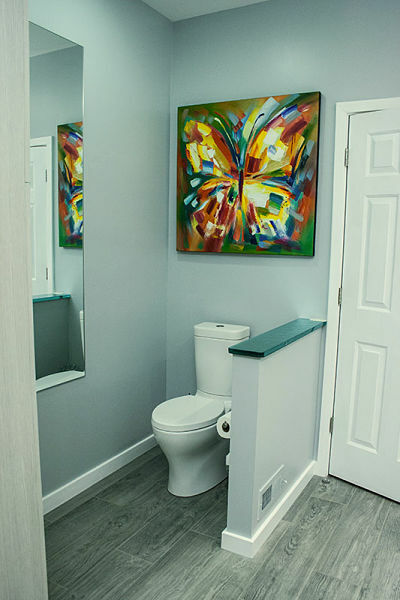 A stylish dual flush water saving toilet (“Persuade” by Kohler) was used in this bathroom remodel. 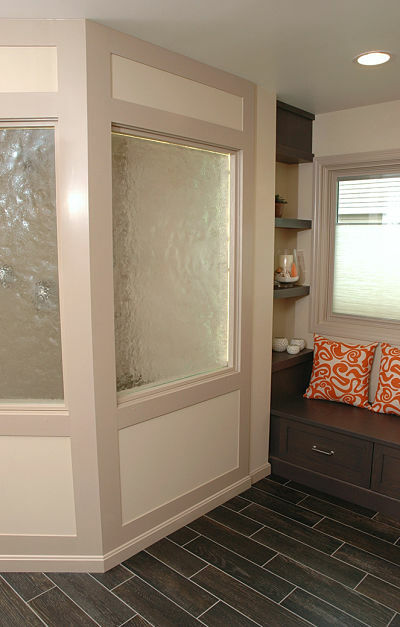 A cast glass cap was used on the knee wall that provides privacy. When it comes to hot products for master baths, think “steam shower.” Steam showers are a luxury but if you’re up to a splurge, why not take the plunge? 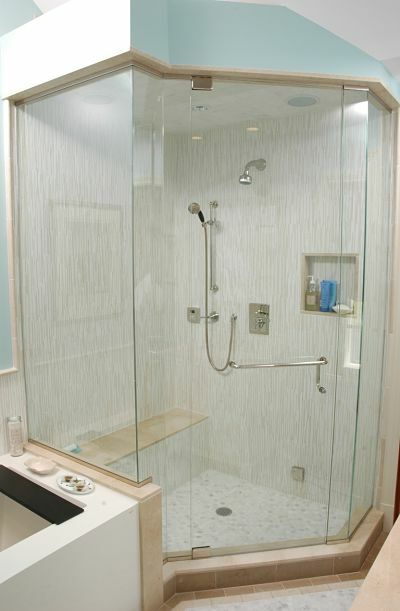 Steam can be an optional feature if you’re planning to add a walk-in shower. The shower must be fully enclosed on all sides for the steam feature to work and you will want to add a shower seat for comfort. This master bath features a steam shower with handheld and wall mounted showerheads, a bench and built-in wall niches for handy access to bath supplies.